The biology of Fjordland Penguins or ‘Tawaki’ is not well-known, they belong to the least studied penguin species. Tawaki are endemic to the southern west coast and some islands off the southern tip of New Zealand’s South Island, where they breed solitarily or in small groups in caves or hollows in the temperate rain forest or in dense shrub. 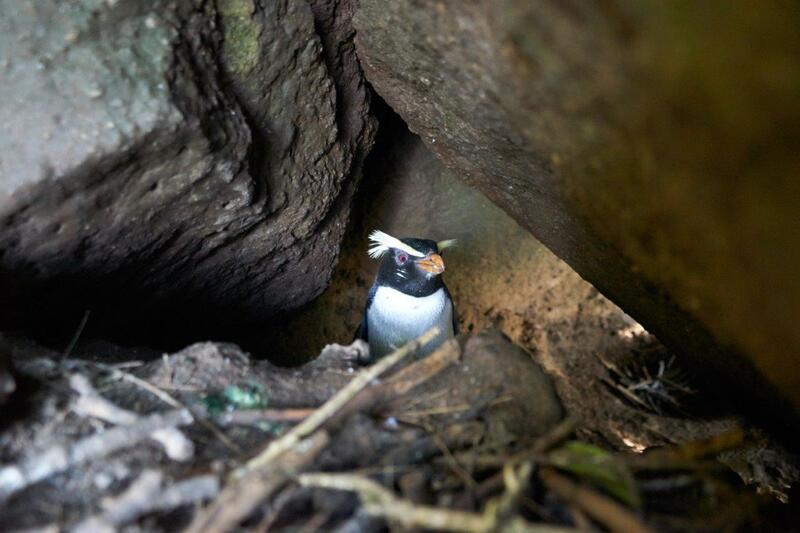 In a 5-year project (2014-19), the foraging ecology of Tawaki, which so far is completely unknown, is studied in cooperation mit Dr. Thomas Mattern and Dr. Ursula Ellenberg using a variety of devices, ranging from dataloggers to satellite transmitters. Apart from their foraging ecology during the breeding season we have also investigated their dispersal during the pre-moult period: Over the course of ca. 2 months the penguins travelled in a southwesterly direction up to 2,500 km away from their colony, covering total swimming distances of up to 6,800 km (1). Currently we are tracking their winter dispersal using satellite transmitters and global locations sensors. Further information can be obtained at the Website of the project and on Facebook.